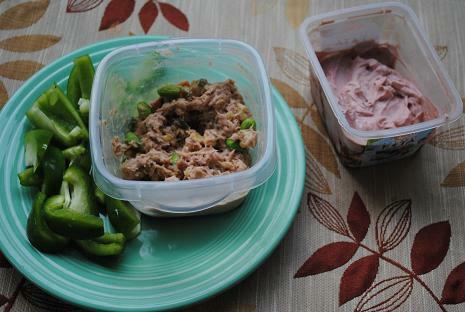 It seems so trivial to talk about my lunch today. All I want to do is share bazillions of wedding pictures and memories with you but I guess that will have to wait for a couple more weeks! 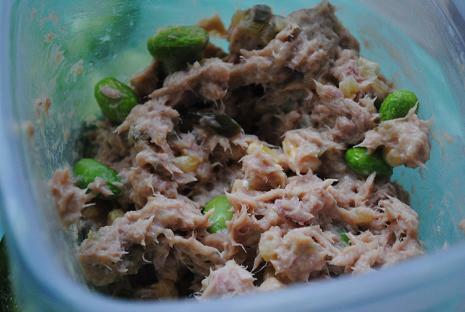 Today’s meal included tuna salad made with one can of tuna, light Miracle Whip, mustard, edamame and sweet corn. 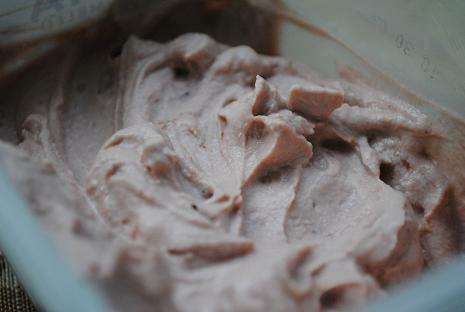 Along with the fishy salad, I also enjoyed a freshly sliced green pepper and a cup of chocolate yogurt mousse. Clearly I am dying to talk about our wedding, but since I won’t have any of the professional pictures from our wedding day for several weeks, I’m trying to hold back. I figured that in the meantime I can post about the things that will not be included in the wedding day pictures, like our bridal party gifts, the rehearsal dinner and the post-wedding brunch at my parents’ house. To kick things off, let’s cover the gifts we gave to our mothers. Ryan and I had a hard time brainstorming what to give to our mothers on our wedding day. We wanted something touching and personal that truly signified the strong relationship we both share with our moms. You guys know I am an Etsy fanatic, and after talking with one of my coworkers, I discovered the most gorgeous handkerchiefs at the mollyandmom shop on the site. I then saw a handkerchief that was embroidered with the most beautiful message. I knew it would be perfect for my mom. I also wanted to show Ryan’s mom just how much she means to me and how much I truly appreciate all of the love she poured into raising the man of my dreams, so I gave her a similar handkerchief with this message before our ceremony. My dad also received a handkerchief from me. The message on his gave me the chills! In addition to the handkerchiefs, Ryan and I gave our mothers Willow Tree figurines. My mother received one of a mother with her daughter, while Ryan’s mom received one of a mother with her son. Ryan and I tried very hard to make our gifts personal, thoughtful and fitting for such an amazing occasion in our lives. I hope our gifts helped signify just how much our mothers mean to us. I love the gifts that you gave your mom, dad and mother-in-law!! Those are so thoughtful!! I can’t wait to see all of the wedding pictures:) Good idea on waiting to go on the honeymoon for a few days, we did the same thing and waited five days to leave on our cruise! Those gifts are awesome ideas. I teared up just reading the one for Ryan’s mom. That is so sweet. Such thoughtful gifts for them. I teared up when I read them- especially the one for your dad. 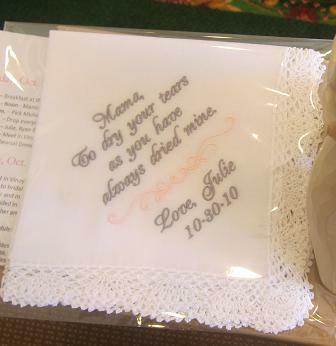 OMG these handkerchiefs bring back memories…when I was looking for a mother of the bride gift for my mom last year I came across these and I had tears streaming down my face reading these (at work), the words are so beautiful!! 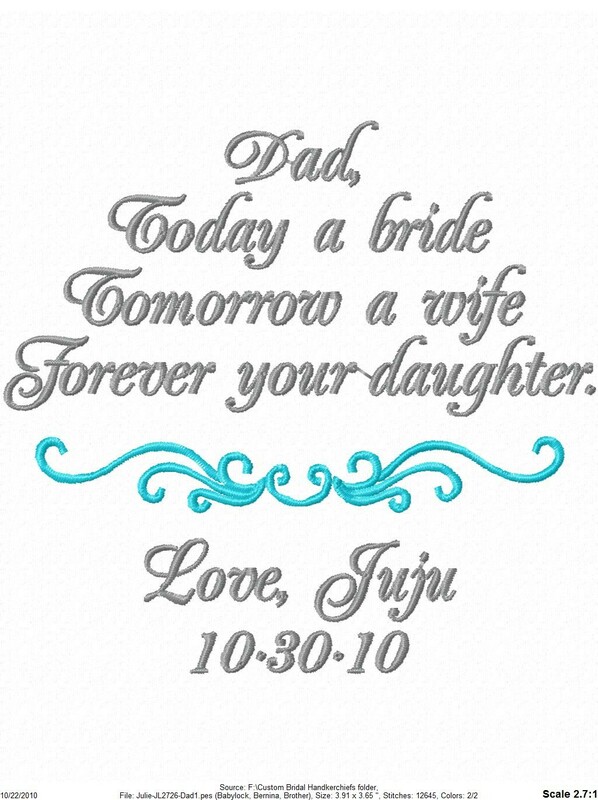 Those handkerchiefs make such a great personalized gift! Looks like you did an amazing job of choosing meaningful, thoughtful gifts! P.S. Isn’t Etsy.com the best?!?! The one for your dad gave me the chills too! Wow! I just got engaged so I’m loving the wedding posts- keep em coming!! The one for your father just made me tear up a bit! What thoughtful, beautiful, creative gifts. I’m sure your mothers and father were so touched. I’m sure they loved them! It’s so special they were personalized! Oh that made me cry!!! How thoughtful of you and Ryan to give that to your Mom’s (and Dad)! I wish I would of thought of that when I got married! So special and something to remember forever! So sweet! I am so happy that you and Ryan are officially married!!!! You two have such a special relationship and I know you are going to be happy for a very long time! 🙂 Cheers Julie! What lovely gifts! I just found your blog from Faith Fitness Fun. Congrats on the wedding. You looked so beautiful! I love my handkerchief and the words you chose for it. I was thankful for it at the ceremony and treasure it now – keeping it close beside me. 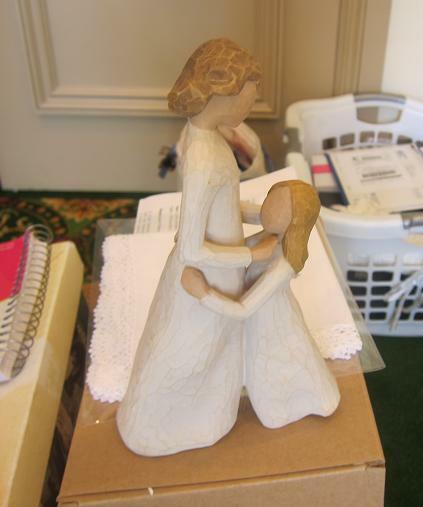 The Willow Tree figurine will always stir my emotions in a wonderful way. I love you so much and couldn’t be happier about your wonderful wedding weekend. Great gifts! Uber personal and perfect. Love it! Fantastic and thoughtful gifts. Your wedding looked beautiful! Such thoughtful gifts- the one for Ryan’s mom is particularly touching!! Though I CAN’T WAIT to see the wedding photos, I love that you’re taking the time to focus on the little, more sentimental aspects of the wedding. You two definitely got married for all the right reasons, which is so wonderful to see!! What a sweet gift to your loved ones, those will keep giving years and years from now. The handkerchief can be used when your parents have their tears of joy when they see their grandkids, lol! I love those Willow Tree figurines, I have a few myself and I think they are so special and personal. Looking forward to more wedding posts!!!! I’m so happy for you! Can't wait to see the real pictures!!! Those are great gifts, love! So sweet and thoughtful … love the hankerchief idea! Congrats!! Your handkerchief for Ryan’s mom made me tear up. That is adorable. Saw the photos from your wedding today–absolutely gorgeous! My husband and I had so much fun on our wedding day that we joke about getting married again!! I teared up at the handkerchief for your dad too. Probably because thats the type of relationship I always wanted with mine. I can just feel the love you have for your family. And those Willow Tree figurines are my favorites. I could buy so many! We have a pregnancy one and a mother/child one on our bookcase shelves in the living room. I love those handkerchiefs! I gave my mom that same figurine for Mother’s Day this past year, love them! such touching gifts… so incredibly sweet. I love the sweet messages, especially the one to your dad! LOVE the idea of giving handkerchiefs as wedding gifts! As a Southern bride to be myself, I’ve been looking for ideas that convey not only the love I have for my parents, but also the love Adam’s parents poured into raising him. My current conundrum is the father of the groom gift. Did you give Ryan’s dad a similar present or was Ryan is charge of separate dad gifts? Thanks!